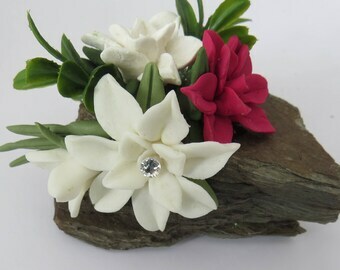 Announcement Notice..........I only do flowers as cake toppers on my wedding cake ornaments. 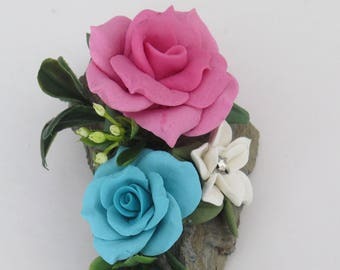 Welcome to my garden of floral delights featuring bread dough roses and cold porcelain flowers made into jewelry, arrangements, hair accessories, cake toppers and more! If you aren't familiar with either bread dough or cold porcelain, you will be delighted with the fact that both mediums are very durable and will never wilt, fade, crumble or die. No tools or molds are used in the creation of my flowers except for daisies, when I'll sometimes use a daisy cutter. 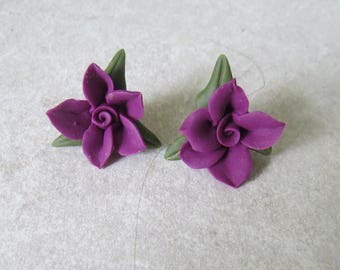 The flowers will last indefinitely and are also a lovely, unique gift. Notice..........I only do flowers as cake toppers on my wedding cake ornaments. Red roses are my favorite just love this necklace, it complets the outfit. Just appreciate your work, will definitely become a repeat customer. Thank you Roberta!!!! This item is out of this world beautiful, I have a love for roses,I will be a repeat customer,I love your work. What a talent you have the roses are out standing. Keep up the great job and thank you. Are you looking for a unique gift for someone special in your life? Does that someone special love flowers? The beauty of bread dough and cold porcelain flowers is that they will never wilt, fade, crumble or die and will last for many years! I discovered a recipe for bread dough roses many years ago and quickly learned that people had an interest in them. They were sold individually and in arrangements at craft shows, in craft boutiques and consignment shops. After developing a line of jewelry, I discovered cold porcelain which is similar to bread dough, and found that I could work smaller and finer with it so I continued developing my line of jewelry and hair accessories. Cold porcelain, like bread dough, is very durable and will last for many years. Wedding cake Christmas ornaments were added two years ago and have proven to be very popular as gifts for newlyweds. 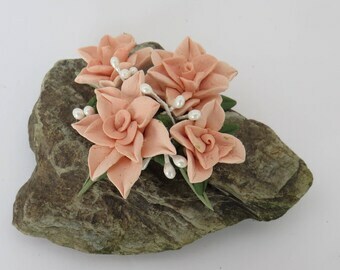 As a bread dough artist for over 30 years, I've spent the past six years creating cold porcelain floral jewelry which is very light, durable and feminine. 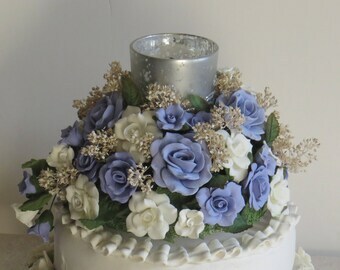 Last year I began creating wedding cake ornaments which have become very popular.